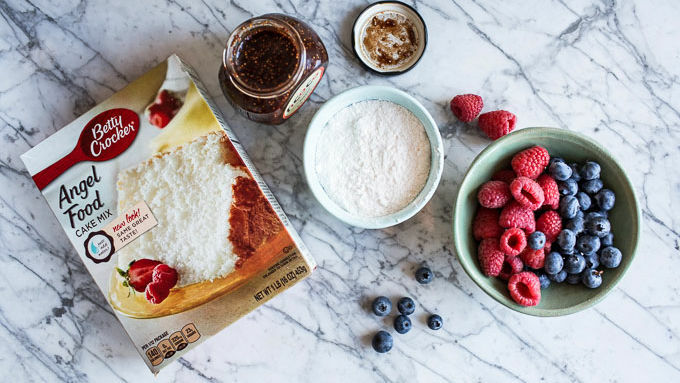 Prepare the angel food cake according to package directions, baking in two 9-inch loaf pans instead of round cake pans. You will only need one of the two 9-inch loaves for this recipe; reserve the remaining loaf for another use or freeze it for a later date. Prepare the instant vanilla pudding according to package directions. To assemble, remove lids from the 5 Mason jars. Cut the loaf of angel food cake into 1-inch cubes. Layer the angel food cake cubes in the jars with the vanilla pudding, raspberry jam and berries, alternating the layers as shown. 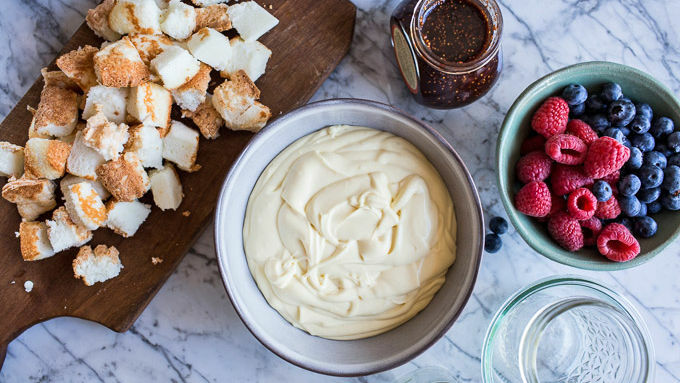 Finish the jars with a layer of whipped cream and sprinkle with berries. Serve, or place in the fridge for up to one hour. Top with the slivered almonds and dust with powdered sugar just before serving. This recipe also requires 5 (12 oz.) Mason jars, cleaned and dry, if served as pictured. For a delicious chocolate trifle, substitute chocolate pudding and Nutella™ for the the vanilla pudding and raspberry jam. I know it’s only April and spring is still in full swing, but to be honest I am so over it. I'm ready to think ahead to summer! Spring in the mountains is mud season and it’s my least favorite time of the year. So I'm jumping ahead and moving right along to Memorial Day… the unofficial start of SUMMER!! Don’t get me wrong, these Mini Trifles would be delicious any time of year, but they'd be the perfect addition to your Memorial Day cookout menu. Or any backyard party or barbecue. This recipe requires 5 (12 oz.) Mason jars, cleaned and dry, if served as pictured. If you don't have Mason jars, this dessert tastes just as great in any kind of dish! They're so cute and easy. 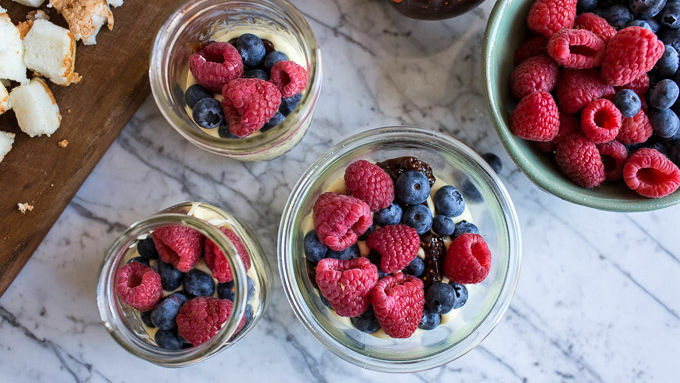 You simply layer angel food cake with vanilla pudding, raspberry jam and fresh berries – all in super cute Mason jars. Then top it all off with a little whipped cream and a dusting of powdered sugar and you’re good to go! Oh, and if you want a chocolate version, just swap the vanilla pudding for chocolate, and the raspberry jam for chocolate hazelnut spread. YUM! 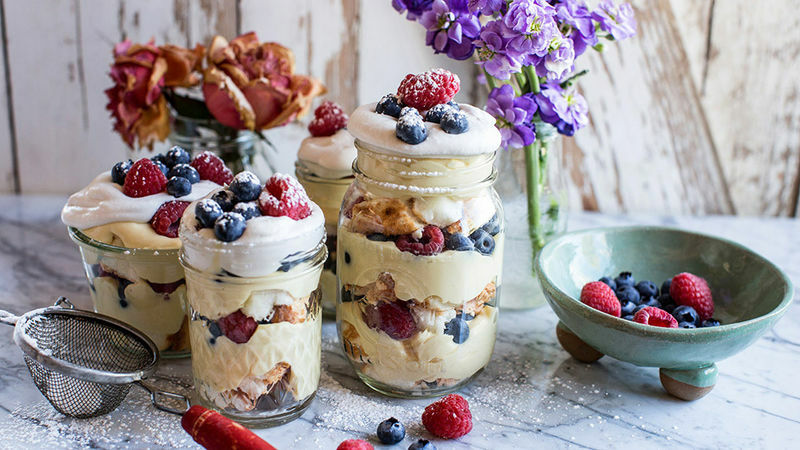 Finish the jars with a layer of whipped cream and sprinkle with berries. Place in the fridge for one hour or until ready to serve. Just before serving, add the slivered almonds and dust with powdered sugar. Perfect!